George showing off his new hairstyle! Today was a day that we'd been excitedly looking forward to for ages - we were meeting Cath and George, and the destination for our day out was going to be Glasgow. But before that it was all exuberant greetings, hugs and a few tears as we met up in Asda's car park which is just outside the ferry terminal at Ardrosson. Then we soon had T4rdis2 stowed in the terminal's long stay car park and we all jumped into George's car to be chauffeur driven to our destination! And that wasn't to be his only 'role' for the day! He turned out to be a very informative 'tour guide' as he showed us around the city that he used to call 'home' when he was 'a wee lad'! First we explored the main shopping areas of Buchanan Street, Sauchiehall Street and Argyle Street, and all the while George was pointing out interesting features such as The Chamber of Commerce - where the statue on the horse wore a funny hat; the Glasgow Royal Concert Hall where a lady was singing on the steps, and The Sir Walter Scott column on George Square. And in addition to all that there were buskers every few yards - and really, your days entertainment could just of been made up watching them! However, there was lots more to do, but before we did, we paused for coffee in a street cafe, a break which gave us time to soak up a bit more of the atmosphere. After our little rest we had another meander along Sauchiehall street and then found our way to the Counting House where we ate our lunch behind bars! The building is now a 'Weatherspoons' Establishment, but many of its lovely architectural features remain for visitors to admire and the 'vault' was one of them. Once tucked away inside we were sheltered from the noise and bustle of the busy pub and we thought we were free to explore the many steel draws and cupboards where untold fortunes must once of been stored. However, as I was nosing my way round I got 'done' by one of the bar staff - maybe she thought I might find a jewel or something similar left behind from times gone by. Anyway, once our energy levels were restored, we tipsily (5 pints of cider between 3 of us - and Cath sat on a Puff! 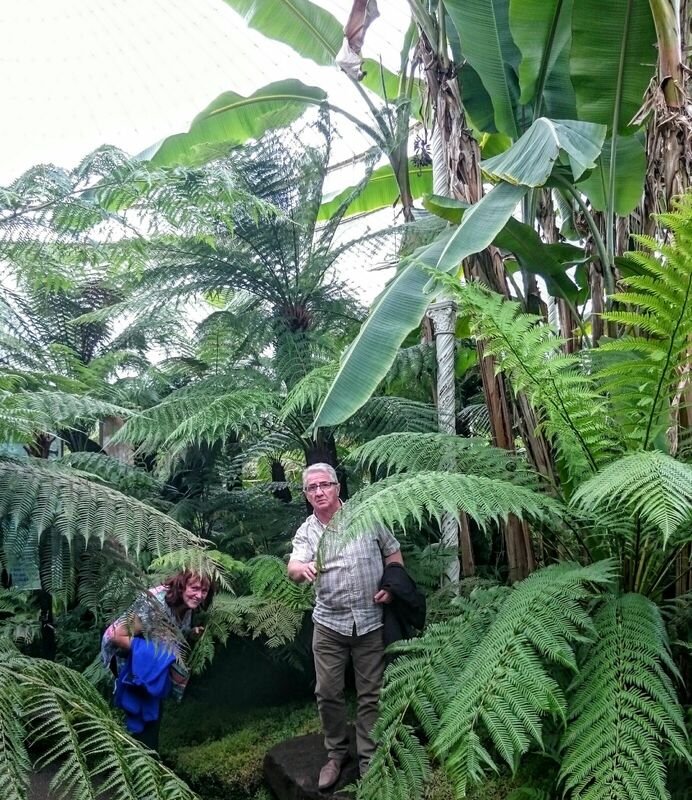 ), left our watering hole and made our way towards Glasgow's subway, and from there a train whisked us off towards our next destination - The Botanical Gardens. Here we found several huge greenhouses full of tropical plants, and at one stage, George and I seemed to be lost in the steaming jungle! But Cath and John came to our rescue when they'd finished hugging! .......before setting off to the Kelvingrove Art Gallery and Museum, another breathtaking building, and where George introduced us to the very fine art works of Rembrant and Van Gogh. We could have spent all day just in that building because there was so much to see, but by now it was nearly closing time and we were all getting a bit tired, so it was back to the subway which we caught backwards! Apparently two trains run in a circle - one clockwise and one anticlockwise - and whichever one we caught it was the wrong one so we almost did a complete circuit to get to our FINAL (next) DESTINATION, which was the Princess Square shopping centre, another of George's old haunts, and a place where we were going to put our feet up for a while and enjoy a little top up for our tipsiness (George and me excluded)! 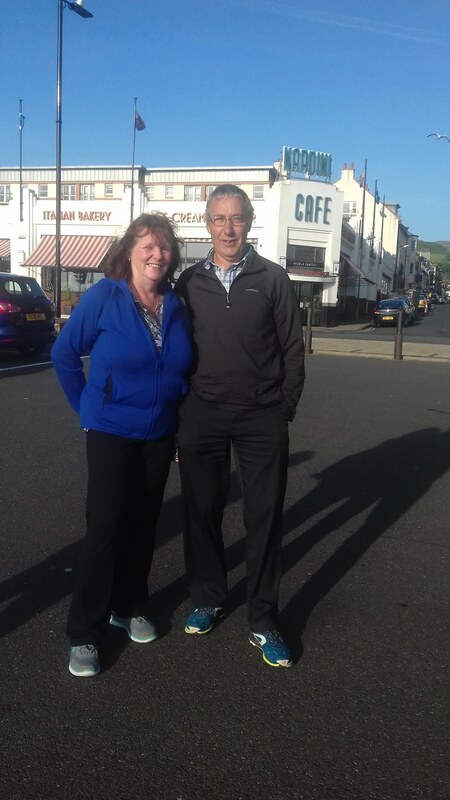 By now it was getting on towards 5.30pm and we decided unanimously that there really is only so much of Glasgow you can do in one day, so we headed back to the car with a plan to go to Nardini's (Established in 1890) at Largs for a fish & chip supper with ice cream for afters. However, before we could escape from the car park it charged us £14.50 - ouch! But then Nardini's turned out to be a lovely end to a fantastic day with our very dear little 'sis' and George. The sun was dipping towards the sea and we had lovely views from the restaurant over the isles of Cumbrae and Bute as we ate our meal, and by the time we'd done we just had time to nip back to Ardrosson so that Cath and George could catch the last ferry back to Arran, and John and I cheekily stopped over in the Ardrosson long stay car park for the night. Finally, I just need to have a quick rant! George brought us over a copy of The Arran Banner - the Island newspaper. The headline was 'Action planned on the Motorhome Menace'. In really saddened us to read, that since the ferry company 'CalMac' has reduced the fares to take motorhomes over to the Scottish Islands people are indiscriminately 'parking' and taking advantage of 'services' not intended for them. This is understandably upsetting for 'locals' and causing feelings of animosity, against people who live like we do. It is, I'm sure, only a few irresponsible individuals who are spoiling it for the majority! Not much to report today except maybe about my awful nights sleep! It probably wasn't a good idea to park right next to a ferry - it's generators droned all night long, and when I got used to that, about half a dozen seagulls came and did a tap dance while they had a natter on our roof!. We/I left Ardrosson quite bleary eyed, and headed towards our next destination which was to be Innerleithen, a small town that is found in the Scottish Borders. John was particularly keen to revisit this area because he wanted to repeat part of a bike ride that we had done a couple of years ago with our friends Sharon and Paul when we completed a chunk (220 miles ish in 7 days) of the Coast and Castle Cycle Way. However, the ride was to be tomorrows outing, so for today we stopped off at Glentress which is renowned as one of the best mountain biking areas in The Tweed Valley Forest Park. We ate our late lunch in the car park and briefly considered getting our bikes out, but the skies were grey and threatening rain, so instead we settled for one of several way marked walks. We followed the short Glen Trail that led us past towering 100 year old Douglas Firs, and we watched several mountain bikers fly past us on some of the more difficult trails that crossed our path. But in the end we were quite glad we hadn't gone further because just as we stepped back into T4rdis2 the heavens opened, and for the rest of the day the rain mizzeled down without much respite. However, it didn't much matter because we were soon installed in Tweedside Caravan Park where we plan to make our home for the next few days. Well, I really shouldn't have bragged about us not having much rain during this tour! It continued to patter on our roof for a good part of the night, but the morning did dawn with some sunshine. Then, up till about 11am it was showery, but after that both John and the BBC weatherman said we wouldn't have any more wet stuff until much later in the day! Therefore, quite confidently we packed our flask and picnic and set our bikes off in the direction of the moors, and as we went we remmanised about our previous journey with Sharon and Paul. First we passed through the golf course, and then the very quiet road gently rose up as it took us for about 12 miles over The Moorfoot Hills. By the time we got to the top we were both quite hungry, and having spent quite a bit of energy getting there I desperately wanted my lunch, and I wasn't going to be deterred. However, setting our picnic out at that stage was a bit of a gamble because behind us we could see the pouring rain racing up the valley towards us, but needs must, so out came our food just as the horizontal rain hit! Maybe that wouldn't have been so bad but the gusting wind made the raindrops feel like ice pellets as they hit our backs and cascaded down our necks and legs resulting in soggy socks and shoes. Therefore, we were forced to stand with our backs to the howling wind while we munched our sandwiches, and our meal was completed in double quick time, but we did see the funny side, and as we zoomed downhill after lunch we soon dried out! By the time we got home we had only done about 30 miles but I was flagging - I'm not sure how we managed nearly twice as far with heavy panniers strapped on the back a couple of years ago! Today is our last full day in Scotland, and as the sun had got it's hat on we definitely needed to go out to play. So out came our bikes again and we headed off towards Peebles, a little town about 10 miles away by quite country roads, or as we later found out, only 5 miles by cycle track! Never mind, our way was very scenic and early on in the ride we had the pleasure of 'sailing' along beside the babbling Tweed River on one side, while the majestic Douglas Firs towered over us on the other. The Tweed has it's source in the Southern uplands of Scotland and is approximately 97 miles long, and it's main claim to fame is it's international status for it's salmon stock. We also passed near to Drumeizier - allegedly the burial place of Merlin the Wizard - but we didn't actually go and investigate further because it would have added quite a few miles to our ride - which in the end turned out to be another 30 anyway. 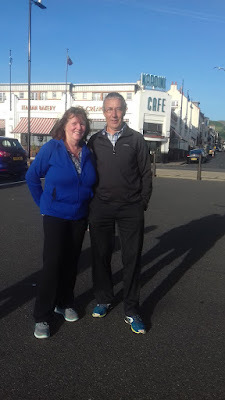 Eventually, we rolled into the town of Peebles which straddles the River Tweed, and as we sat and sipped our morning coffee we pondered on what might be going on in the town, because it was quite obvious that they were gearing up for some sort of event! There was a huge fair just setting up in the park, and there was red and white bunting, along with several pictorial displays festooning most of the town and many of it's buildings. We soon learnt that they were preparing for The Beltane Festival - an ancient celebration that was resurrected in 1988 as a celebration where people could get together and revel in the birth of Summer. Following our coffee break we left Peebles and rode a little further into the hills and moor lands, but when a little babbling brook with picnic benches beside it presented itself, we decided lunch was in order. After that it was time for our return journey which was completed uneventfully, but the peaceful tranquillity where we could watch birds fluttering and calling, and all completed in warm sunshine made the ride very worthwhile, and a lovely end to our tour in Scotland.